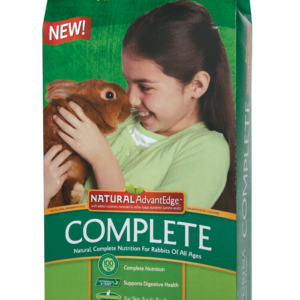 Specially formulated with balanced nutrition – Can be used as the sole diet for breeding birds. Extruded form – Prevents sorting of ingredients and helps reduce the risk of nutrient deficiencies. Natural sources of pigments and antioxidants. 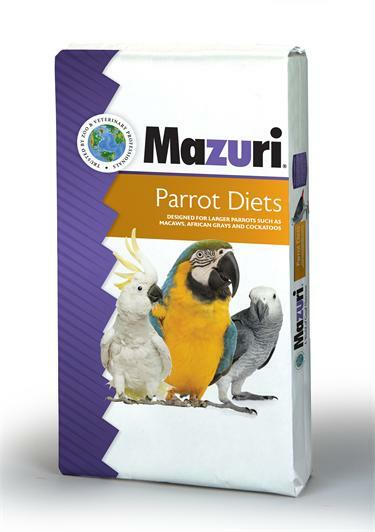 To switch birds from seeds (or any diet they are currently being fed) to Mazuri Parrot Breeder Diet, do a gradual changeover, starting with 90% seed (or current diet) and 10% Mazuri Parrot Breeder Diet. 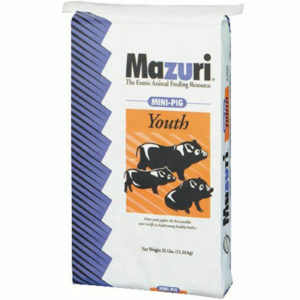 On each succeeding day, reduce the amount of seeds by 10% while increasing the amount of Mazuri Parrot Breeder Diet by 10%. 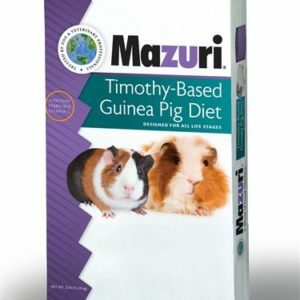 On the 10th day, the diet should consist only of Mazuri Parrot Breeder Diet. Monitor the birds weight and behavior carefully during the conversion period. Be specially attentive during the 10th to 12th day. 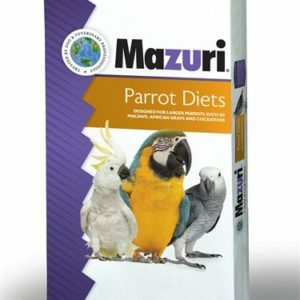 If the bird is losing weight, or if the bird is not consuming the product, offer the bird a mix of 50% seed and 50% Mazuri Parrot Breeder Diet and restart the conversion process from this point. If the bird is not eating, the excreta color will become dark green and the volume will decrease. If the bird is consuming the Mazuri Parrot Breeder Diet, the excreta will be a brownish-green color. This diet should be fed to prepare the birds for breeding and throughout the breeding season. If the birds are seasonal breeders or they are managed to be seasonal breeders, offer the Mazuri Parrot Breeder Diet at the start of the breeding season. If the birds are bred all year, feed this diet continuously. Wean young birds on this diet and continue feeding until first molt. After first molt, switch birds to Mazuri Parrot Maintenance Diet (56A8). Ground Corn, Dehulled Soybean Meal, Corn Gluten Meal, Soybean Oil, Wheat Middlings, Dicalcium Phosphate, Calcium Carbonate, Brewers Dried Yeast, Wheat Germ, Salt, Dried Egg Product, DL-Methionine, Calcium Propionate (a Preservative), L-Lysine, L-ascorbyl-2-polyphosphate, Pyridoxine Hydrochloride,Choline Chloride, Biotin, Beta Carotene, D-Alpha-Tocopheryl Acetate, Menadione Sodium Bisulfite Complex, Cholecalciferol, Folic Acid, Riboflavin,Canthaxanthin, Calcium Pantothenate, Vitamin A Acetate, Nicotinic Acid, Marigold Extract, Thiamine Mononitrate, Vitamin B-12 Supplement, Natural Mixed Tocopherols (a Preservative), Citric Acid, Ascorbic Acid, Rosemary Extract,Lecithin, Manganous Oxide, Zinc Oxide, Ferrous Carbonate, Copper Sulfate, Zinc Sulfate, Calcium Iodate, Cobalt Carbonate, Sodium Selenite.